This car damage repair tool can remove dents from hail, other car doors and more without damaging the surface of your car. It is simple to use. Just three easy steps. The dent can be repaired by it. It is simple to use. Just three easy steps. There was no residue after the repair. No baking paint, no damage to the original paint, fast, cheap and environmentally friendly. Three different sizes of traction gasket strip, suitable for all kinds of indentation. Suitable for automobile surface sheet metal, refrigerator, washing machine surface sheet metal. How to use: 1.Clean the dent with a clean damp cloth. 2.Load the hot melt stick from the back of the hot melt tool, pull the trigger, let the stick enter it, plug in the power, let it preheat for 5 minutes. 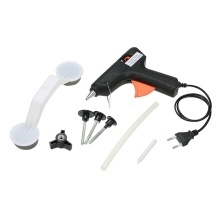 4.Pull the trigger of the glue tool and apply the selected traction gasket with the extruded glue (the 4 holes of the gasket should also be covered with hot melt adhesive). 5.Quickly place the traction pads coated with hot melt adhesive at the center of the dent and gently press until the hot melt adhesive solidifies and sticks. (let the hot melt adhesive dry for about 8 minutes;We suggest that hot melt adhesive should not be allowed to dry for more than 10 minutes. 6.Align the hole in the middle of the traction tension bridge with the attached traction gasket lever, put the screw knob sleeve on the traction gasket bar, and slowly tighten until the indentation is drawn flush with the surrounding surface. 7.Some dent may need to be repeated several times before the dent can be repaired. 8.If the repaired surface is raised a little, follow the steps below: first rub the raised spot back and forth with your thumb until it is as flat as any other surface;If you can&apos;t get the bump back to level with your thumb, tap it gently with a tapping stick (the way you hold the pen) until the bump is back to level.Sometimes, you may need to repeat it several times. (note: do not use too much force when using the bat). 9.After the dent is repaired, remove the screw rotation button, remove the traction tension bridge, and then remove the traction gasket. If there is hot melt adhesive on the surface of the car body, gently tear it off.